CONTACT! Magazine issue 94 May-June 2008 - MUSTANGS! On the cover: 5151 Builder - Glen Holder, KW-909 Builder - Jim Young. Photo credit: LeRoy Cook. The Titan All-Metal P-51 Replica Kit: How it’s Built and Ways To Power It. Len Bechtold expounds the virtues of the Titan Aircraft’s T-51, 3/4 scale Mustang replica. This is the second of two parts and it touches on some of the details concerning construction and the engine options including the two different “Mini Merlin” Suzuki V6. Loehle 5151 Mustang: The P-51 for Walter Mitty. 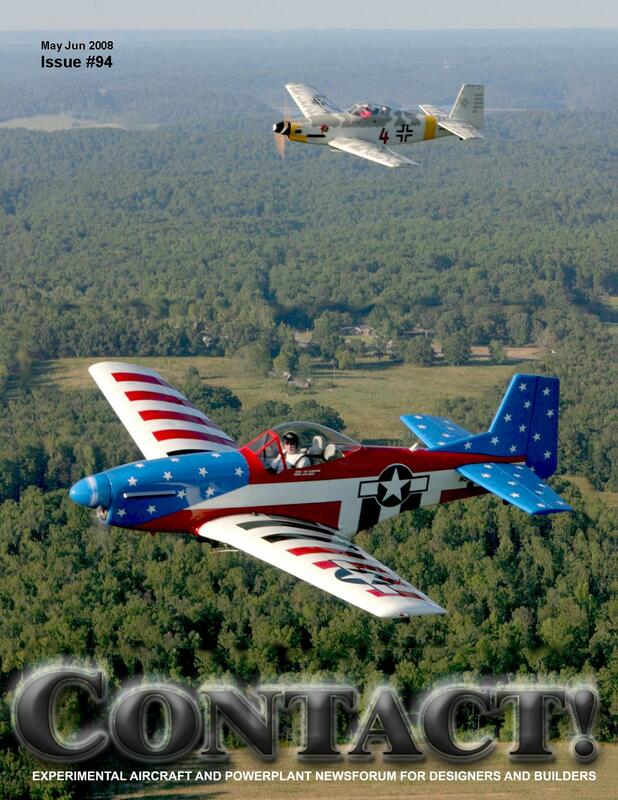 Mike and Sandy Loehle report on their 3/4 scale wood and fabric replica kit, as well as their other warbird offerings. Included in this article is information on their high-gloss coatings. Sport Pilot in seven days: Our very own Nicholas Wood tells us of his unofficial record-breaking accomplishment of receiving his Sport Pilot certificate in seven days with 22 hours logged. Wayne Sprigle’s Mite-T Mustang: How one builder set out to build a P-51 replica on a budget, starting with a set of plans for a wood and fabric Taylor Titch. What is a Taylor Titch: We describe a little about the history of the Titch and the Monoplane designed by the late John Taylor, with permission from his son, Terry Taylor. Last of a Generation: John Miller, 102, Passes away. We say so long to a great friend of aviation and a fixture at the Replica Fighters Headquarters at AirVenture. Subscription information can be found at the bottom of the linked page above.